Former Sindh Secretary for Information and Education, Mrs Mahtab Akbar Rashdi has said that the younger generation is our replica in which we have great hopes as future is waiting for them. She was addressing a students and faculty members of Sir Syed University of Engineering and Technology (SSUET) while delivering a lecture on the topic of “Professional Grooming- Personal excellence comes first” the other day. Mrs Rashdi was the first woman who joined Sindh Government as Secretary and served at different important positions till her retirement from service. “We are the past and you are our replica and we want to you grow” she told the students. At the outset of her lecture she paid rich tributes to great reformer Sir Syed Ahmed Khan for his vision for the Muslims of the sub-continent and produced people like Mr Z.A. Nizami and many other outstanding personalities. She said that Quaid-e-Azam Mohammed Ali Jinnah carved out this country and today we are proud of our country and our being Pakistanis. Telling that “we are the past now and you are the future”, Mrs Rashdi told the students that now it was for them to achieve which they are to achieve as being future hope of the country. She said that when she and people like her entered the practical life, no one was there to tell them about professional grooming. But whatever they learnt, they had it from their home, parents and ultimately their teachers. Mahtab pointed out that today is the world of competition and it is time fior them to learn how to march ahead as their strength is to be channelized for the country. With the help of slides she explained to them at length as to what is a professional image and how to create it and quoted Laura Morgan Roberts who said that “if you are not managing your own professional image, others are”. She categorized professional image as desired and undesired ones and explained as to what steps they can take to ensure that they are projecting the professional image they want. Their concern should be as to what their key constituent might say about them when they are not in the room. She informed them about components of professional image which include personal appearance through clothing, grooming and personal behavior through manners and etiquettes and communication effectiveness. Mrs Rashdi reminded them that judgments are made about people based on the professional image they display. She told them to think of a person who made a reat first impression on them and said having a good professional image is key because they never get a second chance to make a first impression. She dilated upon projecting professional image matters, attributes of a professional image, appropriate professional appearance, professional personal behavior, manners and etiquettes, non-verbal communication and verbal and written communication. In his presidential remarks on the occasion, the Chancellor SSUET, Mr Z.A. Nizami assured that such lecture sessions will continue for grooming of youth for augmentation of their knowledge to help lead them to their successful future career..
Mr Nizami said the University will continuously hold grooming lectures for its students with regard to their behavior and appearance for which all required facilities will be provided and which the university was already doing through career planning. 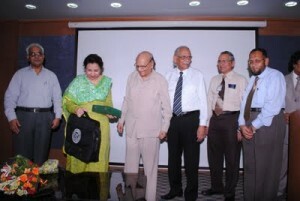 On the occasion Mrs Rashdi was presented university plaque and souvenirs by Chancellor Mr Z A Nizami. As it was Defence of Pakistan Day, the participants and guests lit the candles to demonstrate their commitment to the Defence of Pakistan and in memory of the martyrs of 1965 war with India.